Hydrangeas are large, old-fashioned deciduous shrubs that feature huge masses of pink, purple, cream or blue flowers. The blooms retain their color when dried, so they are often used in crafts. Hydrangeas grow well in areas that have moist soil and when exposed to morning sun followed by afternoon shade. These beautiful plants can be divided into four broad groups, and each group has many varieties. Big-leaf hydrangeas (Hydrangea macrophylla) are the most colorful of the hydrangeas. These shrubs can reach a height and width of 7 feet, with clusters of blooms that are either pink or blue, depending on the pH level of the soil. In the fall, the leaves turn red and orange. The blooms take one of two forms. Hortensia big-leaf hydrangeas have large, heavy solid masses of flowers. Popular varieties of hortensia include Nikko Blue, which has true blue flower heads, and Carmen, which has extra-large pink flowers. Lacecaps have a cluster of non-showy, small flowers surrounded by a border of larger, showy flowers. Popular varieties of lacecaps include Blue Wave and Coerulea, which both have blue flowers. Some lacecap varieties also have variegated foliage, including the aptly named Variegata. Hydrangea arborescens are best-known for their extremely large flower heads. While not as bright as the big-leaf hydrangeas, the white masses of flowers are larger, sometimes reaching a diameter of 1 foot across. 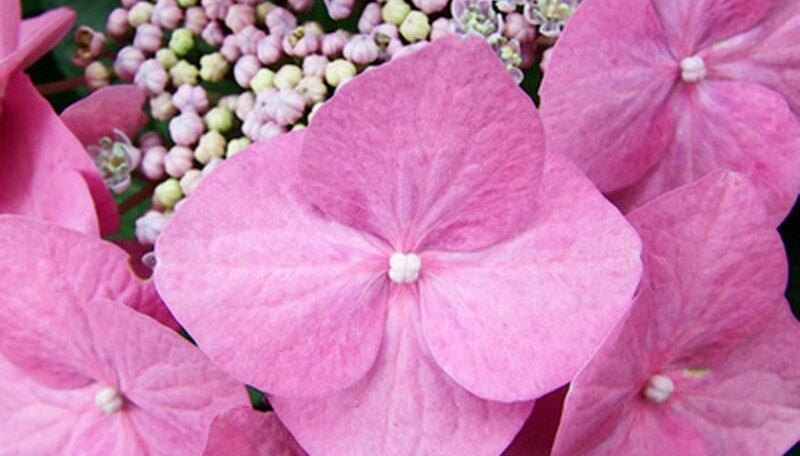 Anabelle is the most popular variety of smooth-leaf hydrangea. The perfectly round balls of cream-colored flowers on this shrub average between 10 and 12 inches across. Smooth-leaf hydrangeas are not as cold-hardy as big leaf hydrangeas, but they are popular in the south. Hydrangea paniculata is the hardiest of all the hydrangeas. These plants can grow in cold or warm conditions, although they prefer more sun than big-leaf hydrangeas. They are the only hydrangea that can be trained to grow on one trunk like a tree. In fact, they can be pruned at just about any time of the year rather than in the fall like other hydrangeas. The blooms are cone-shaped (panicule-shaped) rather than round. While paniculata hydrangeas bloom as cream-colored flowers, some varieties, including the popular Grandiflora, have blooms that slowly turn pink as they age. The Grandiflora variety of paniculata can reach a height of 10 feet tall, making it one of the largest hydrangeas. Hydrangea quercifolia is a hydrangea group that is native to the United States. This is the best type of hydrangea to plant in dry conditions because these plants can withstand drought better than the other three hydrangea groups. The blooms are cone-shaped and are either double or single-petaled. In all varieties, the blooms start off white, but in some varieties, they gradually turn pink as they age. The leaves of oak leaf hydrangeas are so named because they are shaped like oak tree leaves. In the fall, they turn brilliantly red and orange, like big-leaf hydrangeas. Snowflake is a variety of oak leaf hydrangea that features double blooms. The Sikes Dwarf variety is compact and well-suited to small gardens.